MyMemories Blog: Meet Today's Daily Designer....Art for Scrapbooking! Meet Today's Daily Designer....Art for Scrapbooking! I have 2 grown children - an accountant, a volunteer co-ordinator [daughters who live in Brisbane Australia] and a computer game technical director [my son who lives in Montreal Canada.]. My first grandchild is due on the 22nd November. I have been married for 36 years to a very very patient man. One of my secret pleasures is watching The Bold and the Beautiful and really bad Disaster movies. I have chosen to share my favourite layout with you as it says a lot about me. 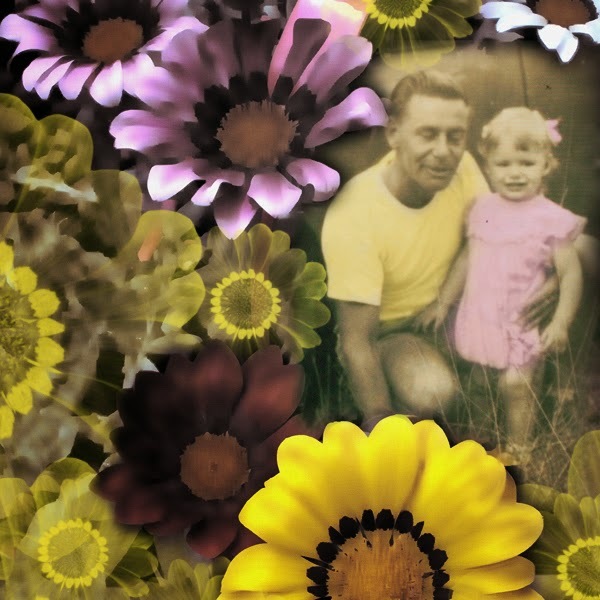 The photo is me and my dad who passed away last year.I play around taking photos and I made this with flowers I had photographed blended in layers with the photo. I then selectively colored the Tshirt and dress to enhance them. As the birth of my first Grandchild draws closer and I grow older I am more aware of how precious every moment is. Mum would have not thought that 54 years after this photo was taken I would be sitting here writing this and remembering what was a simple but special moment. Take time to enjoy your life and take time to keep and pass on the memories. Thanks for reading a little from me. I sell exclusively at MyMemories and my whole store is on sale 30% off until midnight sunday. Check my Facebook for my Blog Train contribution and check my store for my weekly gift. Visit Art for Scrapbooking at these Social Media Sites! Enjoy 30% off Art for Scrapbooking! Beautiful page & memory! Love the 3D look and feel that it has too!